by William D. Lynn, M.D. From 1927 through the summer of 1969, Hyde Bay Camp was Shangri-La on the shores of Lake Otsego, eight miles north of Cooperstown, New York. It was started by former Gilman history teacher Herbert Pickett as a summer tutoring project to help struggling students. The first camper was Page Smith. 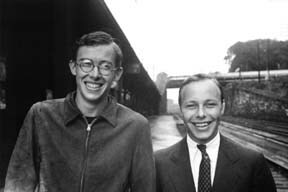 Like Walter, Page was a Gilman student who went on to become a renowned historian and much-published author. Over the 52 years that Hyde Bay was in operation, hundreds of boys --- many from Gilman - spent their summers on Lake Otsego. 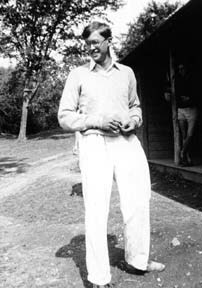 During much of the 1930s and into the 1940s, Walter Lord was a camper, counselor and ultimately The Commodore. The Commodore was a title he bestowed on himself, and his many friends called him that until the end. Despite Walter's later fame for the Titanic, Commodore was an odd choice of nicknames, because Walter did NOT know how to sail. The nickname DID come in handy each year when Walter would preside over Hyde Bay's Eight Inch Regatta. Campers would build something with wood and paper to resemble a sailboat measuring no more than eight inches. And one day each summer, perhaps a hundred boats would be dropped in the Lake for the Regatta. After some time and distance had been covered, a winner would be declared. In a ceremony with great pomp and circumstance, Walter, dressed appropriately as a Commodore, would present the Eight-Inch Regatta Cup to the youngster who may have actually won the race. To his final day, Walter kept the Eight-Inch Regatta trophy in his New York apartment, next to the priceless artifacts from the Titanic. The trophy was simply a cooking pot with a lid. Walter loved ceremony and pomp and circumstance, but underlying it all was farce and comedy. His "ceremony" was the kind perfected by the Marx Brothers. One ceremony was especially memorable. At Hyde Bay, there were a number of barnyard animals kept on the property - a few goats and chickens. One summer, a new pig was brought to join the other animals. It was Walter's belief that this pig, which was named Pearl, should have a party in her honor. It should be a debutante party. Walter made the plans and even had invitations made for those to be invited. In Walter's mind, a debutante party wasn't a first-class affair unless there was someone to CRASH the party. Walter appointed ME to be the un-invited party crasher. With no invitation, I was to arrive at a certain time and CRASH the party. Unfortunately I fell asleep in my tent. Walter sent a group of campers to wake me so I could be brought to crash Pearl's debutante party as planned. In 1985, I retired and Walter held a small retirement party for me with a handful of lifelong friends. One of the gifts given to me that night was from Walter --- a small tattered piece of paper. Fifty years later, Walter was giving me the original invitation to Pearl the Pig's debutante party from 1935. When people recall Walter, many will think of an ocean liner at the bottom of the Atlantic. I will remember an eight-inch sailboat, a party for a pig and many wonderful summers at Hyde Bay Camp. The Commodore's service last Sunday. I would like to have gone but couldn't make it. Monday morning a classmate of mine, Dawson Farber, called for two reasons. He calls me yearly to ask me to contribute to the Gilman Fund, which I do very modestly. Most of all he wanted to tell me of the Lord service. He said it was a marvelous occasion, lasting over two hours. The important thing is that Billy Lynn gave a thorough description of what Hyde Bay meant to the Commodore. What touched me particularly was that Walter's relationship with my father was also emphasized. I am glad of that because it was a special relationship. A Walter-at-Hyde-Bay story. About the third year of going to Trenton Falls, we discovered that there had been torrential rains in the Adirondacks and the West Canada Creek was in flood stage. When we went into the powerhouse, (we had complete freedom to wander all over the place in those innocent days,) all seven generators were running full blast, and up in the gorge, all the falls were running as if there were no power plant. When we got on the river, the usual white water rapids were several feet deep and it was an ordinary river. I was stern in a canoe, Walter my bow and some kid in the center. When we got to the usual take-out place, Dad, who was in charge, his last year, decided to go on to the next town, over the "Ledges," a portion of the river we had tried the first year and had to walk most of the ways. When we got into it, it was rough. Every canoe but Dad's capsized. When ours went over, Walter was in his element. He shouted, "Shipwreck! Shipwreck! The Titanic!" He hung a shirt on a paddle and waved it about. He had a ball. A couple of Commodore stories totally irrelevant to HBC but characteristic of the person. Walter (Wally to me) was totally unathletic. With Gilman's requirement of athletics for all, he did cross country in the fall, special exercises in the winter, but in the spring, he was on the track team, running the quarter mile. He competed joyfully. I don't recollect that he ever won a race, but his spiked feet swinging wildly in all directions scared some of the competitors off. Another story from Princeton. His roommate all four years was another Gilman boy, Oliver Reeder, who was Walter's total opposite, square, conventional to the nth degree. He did cooperate with Walter in climbing to the tower of Nassau Hall to steal the clapper of the bell. If the bell did not ring, there were no classes. If one was caught, it was immediate expulsion. They succeeded and Walter had the clapper sliced in half, and mounted on fine oak plaques. You must have seen it in his apartment. One day, Walter, Billy Lynn, and some other choice spirits were gathered in the room, and Oliver was away form Princeton for some reason. Walter's feet were enormous. I think he had to wear size 13 shoes. The living room of their digs had a fireplace that had been used. Walter took off his shoes, rubbed his feet on the soot at the back of the fireplace, the other guys carried him to Oliver's bedroom, and held him up to put a black footprint on the wall, first the right then the left. They continued, having to go back to the fireplace again and again, up the wall, over the ceiling and down the other side. They then got some fixing spray used by artists on charcoal drawings and sprayed the foot prints. Oliver returned, showed not the slightest reaction, but a couple of days later a painting contractor arrived and did over Oliver's room. I'll send you some photos from my early days with Walter that you might find helpful for the Commodore history.